Members of the Chinese delegation experience what it’s like to stand in a cranberry bog for the first time during the U.S. Cranberry Marketing Committee's Reverse Trade Mission Thursday, Oct. 26, 2017, at Cutler Cranberry Co. in Wisconsin. 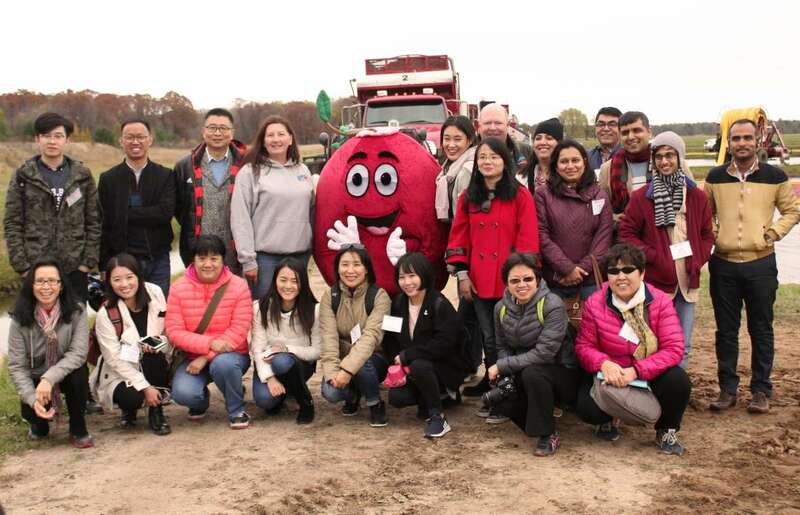 Food buyers, bloggers and social media influencers from China and India recently came to Wisconsin’s cranberry country in hopes of driving up demand for the fruit overseas to alleviate an oversupply that’s driving down prices for farmers. Around 20 people from two of the world’s fastest growing economies visited the Cutler Cranberry Co. farm near Tomah last week to see how the tart, red fruit is harvested, processed and packaged. The trip, dubbed the Reverse Trade Mission, was organized by the U.S. Cranberry Marketing Committee, and is one of many efforts to offset an oversupply of fruit after a record harvest in 2016 followed by another strong harvest this year, said Tom Lochner, Wisconsin Cranberry Growers Association executive director. That glut caused the price of a 100-pound barrel of fresh cranberries to drop by 21 percent in 2016. The price for a barrel of processed fruit ticked upward, and overall prices remained stagnant from 2015. "Sales of cranberry products are growing. 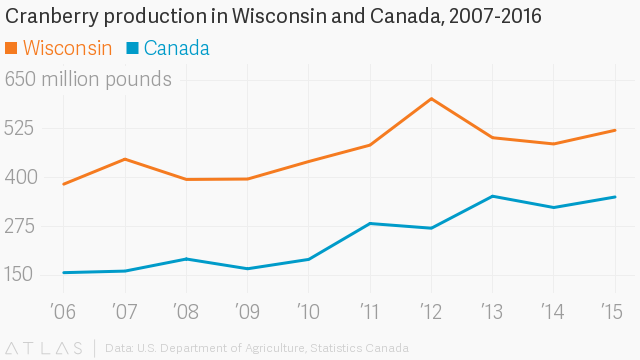 We see an increase each year, probably averaging 3 to 4 percent a year over the last five or six years," Lochner said. "The problem is we’ve been growing them faster than we’re selling them. So, that’s why we’ve seen an accumulation of inventories." That’s where the three-day Reverse Trade Mission comes in. The hope is the Chinese and Indian delegations will return home and spread the word about the uses and potential health benefits of cranberries. Mabel Zhuang is the founder of M.Z. Consulting in Shanghai. She contracts with the U.S. Cranberry Marketing Committee and was part of the first United States-branded campaign there that began in 2013 and continues today. "At that time (in 2013) we did a survey. Less than 4 percent of Chinese consumers were aware of cranberries as a fruit compared with blueberries, strawberries, they are very high awareness rate," Zhuang said. "But after five years promotion, now the awareness rate has increased to over 50 percent. It’s a huge increase in the past five years." For now only sweetened, dried cranberries are allowed in China. The U.S. government is working on an agreement with their Chinese counterparts to allow fresh cranberries from the U.S. be imported into China. In the meantime, Zhuang said the dried berries are becoming popular for use in things like bread and cookies. "And the new trend is they are adding cranberry into a daily nuts, which just emerged last year," Zhuang said. "The Chinese consumer has a tradition to consume dried nuts and fruits, and they are even used as gifts for Chinese New Year." This summer the U.S. marking committee made its first moves into India. It’s another example of the industry trying to get a foothold in part of the world with a growing middle class. Ravindra Yadev is an international trade consultant for India-based Technopak Advisors, a contractor for the U.S. cranberry industry. He said only a small percentage of the population has ever heard of the fruit, but they’re working to change that. Like in China, only sweetened, dried cranberries and concentrate are available in India, so Yadev said the trick is to find uses beyond bakery items. "The most challenging thing would be to incorporate cranberry into the food," Yadev said. "Otherwise, taking it as a health supplement is absolutely OK, cranberry juice is picking up. But to have it as a part of the daily meal is kind of a challenge, but I think they are working on it. We have hired a few chefs who will be developing recipes, Indian recipes, around cranberries." Growing demand overseas will take time and money, but staying in these markets is vitally important, said Brooks Erickson, a Seattle-based consultant for the U.S. Cranberry Marketing Committee. "In terms of this specific trip, China and India are really huge markets that we’ve just gotten started in, and I think that for the future health of this industry it will be important to continue to invest in them to really increase the demand overseas," Erickson said. The reverse trade mission cost around $60,000 and was paid for by federal grants and fees paid on each barrel of cranberries. While growers wait for their labors in Asia to bear fruit, they're hopeful the long-term strategy will stabilize the market and improve prices. To further deal with the oversupply of cranberries the industry took the rare step of asking the U.S. Department of Agriculture to set production limits. If the agency agrees, growers will only be allowed to deliver 75 percent of their total capacity to processors this year and in 2018. There’s no word on when or if the USDA will agree. In 2014 the agency turned down a similar request.